We greet you in the name of hundreds of thousands of Egyptian workers who are entering a great battle to complete the goals of our great revolution of social justice and cleansing our country of corruption. We founded the Egyptian Federation of Independent Trade Unions in Tahrir Square in the midst of the revolution with four independent unions. Now our numbers have increased to more than 100 unions with a membership of around 1 million workers in all economic sectors. Our ranks include pilots and peasants, transport workers and postal workers, teachers and health workers, and we are calling on all those who work for a wage to join us in our struggle for our legitimate rights to a decent life, and against poverty, hunger and dictatorship. We welcome your solidarity with us, and we have not forgotten the long history of workers’ solidarity between Egypt and Britain even during the period of British occupation of our country. We salute your support for the struggle of our brothers and sisters in Occupied Palestine and we welcome the decision of TUC Congress 2011 to review its links with all Israeli institutions including the Histadrut. We urge colleagues in the British trade union movement to cut all connections with this racist body which has no link with the genuine workers’ movement. We also wish to send you solidarity greetings in your battle with the British government in defence of the right to decent pension in old age. Your struggle cannot be separated from our struggle against the governments of businessmen which want to make workers and the poor pay the price for the world economic crisis. However we wish to clarify one issue related to foreign funding. 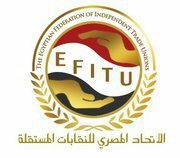 Unions affiliated to EFITU took a decision on 28 June of this year to rely solely for their funding on the contributions of their members and not to receive or seek funding from any other source inside or outside Egypt. We also wish to inform you that the Centre for Trade Union and Workers Services has withdrawn from the founding process of EFITU. Our belief is that the best kind of international solidarity is the exchange of experiences with the aim of supporting our common goals and so we encourage you to get in contact with us in order to exchange information about workers’ struggles in our two countries. We also urge you to continue to put pressure on the Egyptian civilian and military authorities over the abolition of the law criminalising strikes and protests, the end of military trials for civilians and to provide legal protection for trade union freedoms. We emphasize once again our desire to deepen solidarity links between the trade union movement in Britain and the independent unions in Egypt in the context of our common struggle for social justice and freedom. Long live the struggle of workers in Britain and Egypt! October 4, 2011 in Egypt, Regional, Statements, Union news.